“It is the great privilege of Christians, that they have the mind of Christ revealed to them by his Spirit,” reminds Bible expositor Matthew Henry. The Holy Spirit uses God’s Word to speak to us (John 16:12–14) and to reveal His will for our lives. How do you know if what your pastor, you Sunday School teacher, your favorite podcast preacher, or your favorite Christian author is teaching you matches up with what the Bible actually says? Did you know that you’re supposed to examine what you hear and read by the measuring stick of Scripture and reject anything that conflicts with it? Or do you just take for granted that if someone is a pastor, teacher, or Christian celebrity, he must know what he’s talking about, and what you’re hearing or reading must be biblical Christianity? If you didn’t know you need to examine what you’re being taught, or you’ve always just assumed that if someone calls herself a Christian teacher what she’s saying must be biblical, sadly, you are not alone. In fact, you are in the overwhelming majority of the visible church. I’ve been a faithful church member all my life and, to this day, in the churches I’ve attended, I’ve never heard a pastor or teacher proactively preach or teach this biblical concept. I was nearly forty when I “stumbled across” the concept of being a good Berean – through a para-church ministry. What does it mean to be a Berean, or discerning, or to “test the spirits”? But all of these passages have the same foundational concept. All Christians are to believe what rightly handled, in context Scripture teaches, and reject whatever contradicts it. 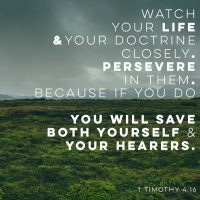 Although it is the responsibility of our pastors and church leaders to teach and lead us to distinguish between true and false doctrine, we are not to depend solely on others to “do discernment” for us. We need to learn how to be good Bereans ourselves.